2 items found searching fields. 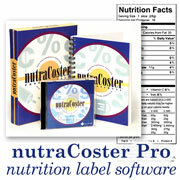 stockCoster 2.1 is the inventory add-on module for SweetWARE's nutraCoster Professional 2.1 Recipe/Formula Costing and Nutritional Analysis Software. A powerful tool for tracking, valuing and analyzing your inventory, it allows you to easily track both raw materials and finished goods. Enter your inventory re... more.